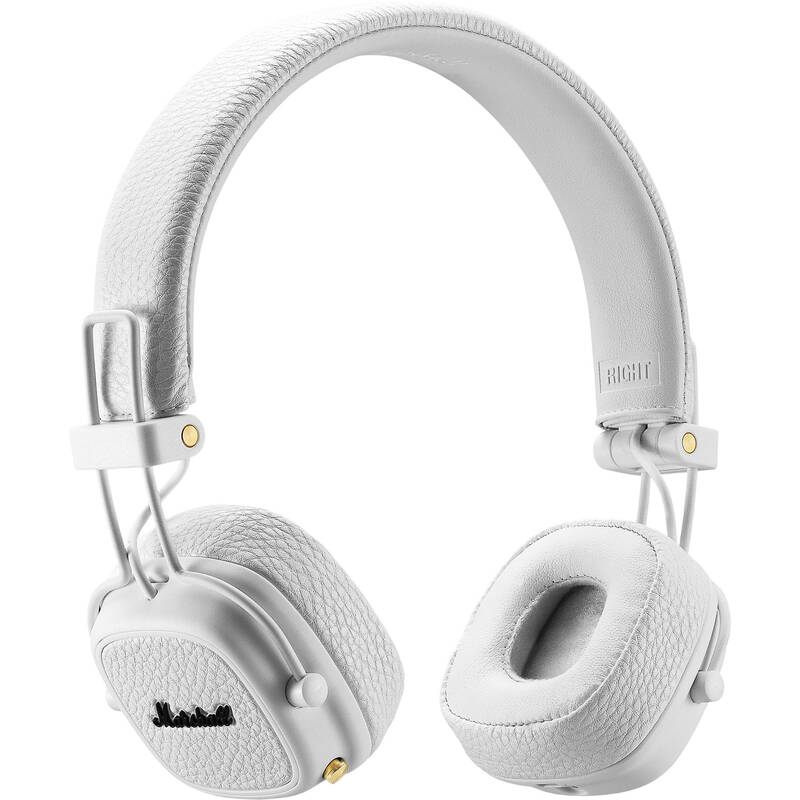 Mixing modern technology with a classic aesthetic, the Marshall Major III Bluetooth On-Ear Headphones features Marshall's iconic vinyl texture on the exterior of the headband, earcup, and ear cushion edges, along with the signature Marshall script logo emblazoned on each earcup. On the inside, the Major III boasts 40mm dynamic drivers that are tuned and engineered for enhanced bass, smooth mids, and clear highs. With support for Bluetooth aptX, they can stream your favorite audio in high quality when paired with compatible devices. When paired with a Bluetooth-compatible smartphone, you can also make and take hands-free phone calls with the built-in microphone and control knob. The Marshall Major III headphones combine the comfort and ergonomics of 3D hinges, a padded headband, and soft earcups, with the durability of thick loop wires and reinforced rubber dampers. The Major III wireless headphones feature a built-in, multi-directional control knob that lets you manage both audio playback and phone calls. You can answer, reject, or end calls wirelessly, while your phone remains safely stored in your pocket or bag. For audio playback, the knob gives you control to play, pause, shuffle, and adjust the volume of the paired device. If you're streaming music via Bluetooth that you want to share with a friend, they can get in on the action by simply plugging in the 3.5mm plug of their wired headphones into the available input on the Major III earcup. While the Marshall Major III headphones are designed to be used wirelessly, they can also be used in a wired configuration if your audio source doesn't support Bluetooth. Simply connect the Major III headphones using the included detachable 3.5mm cord. The cable features an in-line microphone and remote, so you can still enjoy remote audio and hands-free call control when wired. Box Dimensions (LxWxH) 10.2 x 9.05 x 5.1"